I am so excited to tell you about this dress. It's my first piece from ModCloth! I know, I know, I am reeeeeally late to the game. My friends have worn the vintage-inspired clothing retailer for years. I never took the plunge because it was not a go-to website for me. After trying on this dress and experiencing their awesome customer service, I think that is about to change. When ModCloth asked if I would like to review an item from their new namesake label, I quickly replied yes because many of you have requested to see them on my blog/channel. Sooo, here we go! 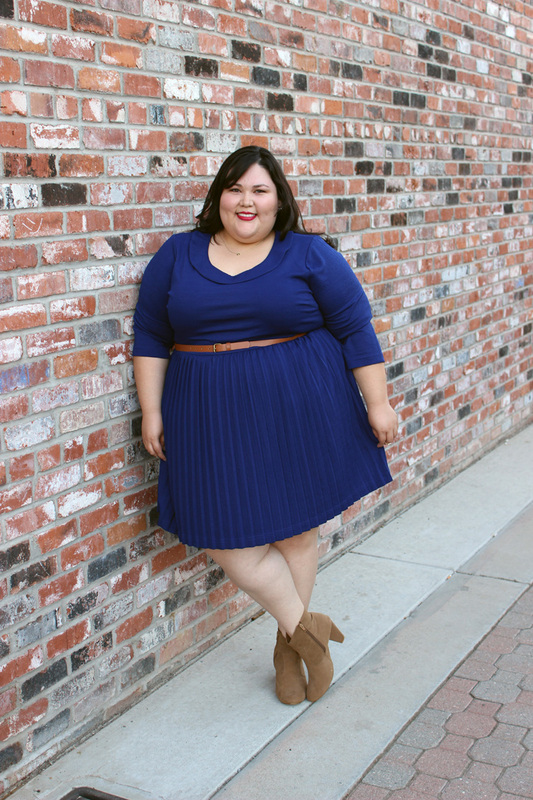 This is the ModCloth Presentation Perfection Dress in size 4X. Since I have never worn the brand before, I used the size chart and customer reviews as references. The fit is excellent. The 3/4 sleeves have plenty of give and the high-waisted pleated skirt moves beautifully. The dress is fully lined and made from a very stretchy, textured knit fabric. The belt that came with the dress did not fit, so I substituted it with an old ASOS Curve belt. The neckline, royal blue color, and length are my favorite parts of the dress. The three are a nice mix of ladylike, fun, and flirty. After a full day of wear, the dress kept its shape without any wrinkles, aaaaaand I may or may not have added more items to my ModCloth shopping bag. This item was gifted for review. All opinions are my own. I admit I cruise the Mod Cloth website as well and have never taken the plunge. They have such awesome looking vintage inspired pieces! At some point I know I will pull the trigger and I am happy to see your review here letting me know about fit and quality. I love this dress on you, especially the pleats. Adorable dress on you. The color is great. Having shopped ModCloth off and on for the past few years, however, I have some issues with them. #1) They recently did away with their 'plus size' link on their website. They still have plus sizes on their site, but now they're just mixed in with everything else. There's no plus size link to click to get to the plus sizes; you just have to look through every item to see if its available in your size. While I like the general idea of not 'segregating' plus sizes in their own group and letting them go play with all the other sizes, the problem is that I don't want to look through every single clothing item to see if it's available in my size. If I see a cute item on the ModCloth website, I don't want to get lured in and start drooling over it online...only to find out its not available in my size. I want to have a designated link where I can look at plus sizes only. I don't think it was very smart of ModCloth to do away with the plus size link. 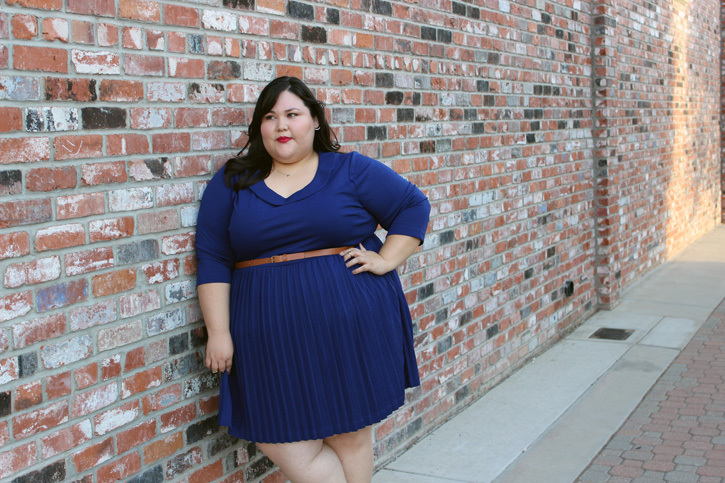 #2) ModCloth sizes are VERY hit or miss. That's because not all their clothes are just ModCloth. They stock plus (and straight) sizes from a bunch of different clothing designers. One designer's 2X may not be cut in the same way another designer's 2X is cut. Some are huge and drapey; some are too small and tight; some fit ok, but the item is cut in a weird way that doesn't work for my body shape at all. More often than not, I'm returning items to ModCloth and not keeping them. I think I have, at most, maybe 4 items in my closet from ModCloth, and 2 of them are sweaters. Because of the hit or miss with the sizes, they're really not a go-to online retailer for me. If the sizing improved, I'd definitely shop there more. I love everything about this dress! The pleating is so adorable! I have never bought anything from modCloth either, but I always find myself looking at their stuff. I love the unique pieces they have. Cute look - the blue color looks fantastic on you! This dress looks amazing on you! I've bought from Modcloth a couple times and like the dresses but never tend to wear them, I'm not sure why lol. Plus they're a little pricey for me unless they're on sale. Really beautiful! The color looks great on you and the booties are awesome with it!